Based on the artwork of Fabrice de Villeneuve, this tapestry "Saint Emilion" shows the famous wines from the Bordeaux region of France. This work is casual yet gorgeously suave which is a signature of de Villeneuve's work. Here we see the wine bottle and lable with a glass of red with a background of the Eiffel tower. 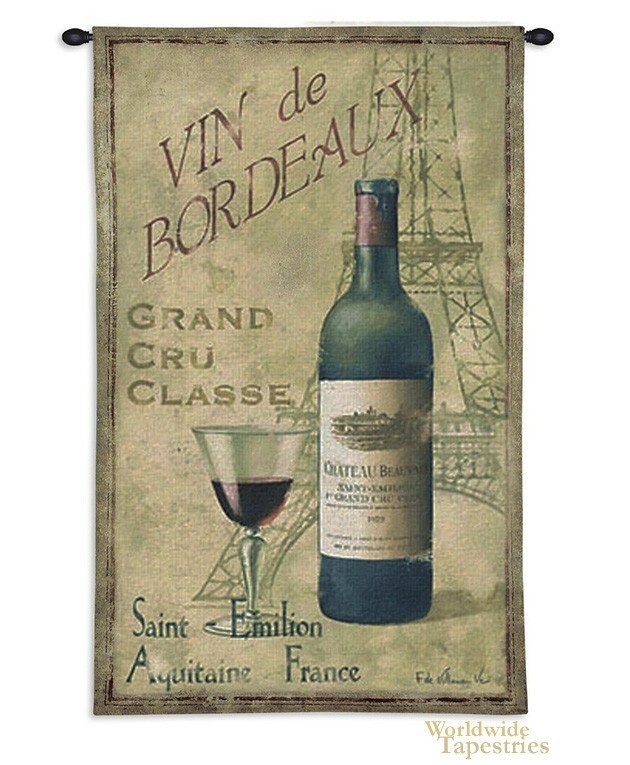 The wines from the Bordeaux region have been classified since the world exhibition in Paris in 1855, and the highest class is referred to as "Grand Crus Classe" which is seen in this poster like tapestry here. To be classified in this top class is highly prestigious. The region of Bordeaux including the regions of Saint Emilion, has produced wine since 48 AD after the invasion of the region by the Romans, to cultivate wine for the soldiers. This tapestry shows the Bordeaux wine in charming French style, and the cohesive colors of burgundy, green and beiges compliment the subject matter very well. This art tapestry "Saint Emilion" is backed with a lining and has a tunnel for easy hanging. Note: tapestry rod and tassels, where pictured, are not included in the price. Dimensions: W 33" x H 53"